money she wanted for the increased elecric use. She told me he has yelled at her in the past but she I tired of it and now she is scared of what he might due to her. She told me that Canada told her he has a Bi-polar disorder and that why he needs the marijuana. I asked her if she knew it was illegal to grow Marijuana and she told me "yes" but he kept telling her that he had a prescription for growing the Marijuana. She went on to tell me that he had asked her in about May or June of this year to allow him to grow the Marijuana in the backyard and she told him "no". She told me she had been in the apartment about a month ago to fix a faucet and saw the plants in a closet next to the kitchen area. She told me about two weeks later she saw bright light coming from the bedroom area of the apartment and she knew they were in his bedroom. She told me that when she confronted him about the consumption of electricity, he suggested she allow him to grow them in the garage and that it would be cheaper to run the lights at night. I asked her if she witnessed a lot of people coming and going from the apartment and she told me "no" however, she is gone to work a lot of the time and arrives home late in the evening. She told me she just wants him to leave the apartment. I told her the legal way to serve him with an eviction notice and the steps to take to insure he will stay gone. I asked her if she had witnessed the subject swerdlow arrive at the location and she told me "yes". I asked her what happened and she told me that he was demanding to talk to Canada. She told me that the officer told him that Canada was being detained and that there was an on-going investigation. She told me the that the subject became increasingly argumentative and refused to leave. After telling the subject to leave the location several times the officer placed him under arrest. I asked her if there was anything unprofessional in the way the officer handled the subject and she told me no. I asked no other question of Millard. Forward this case to the District Attorney for review and filing of charges. 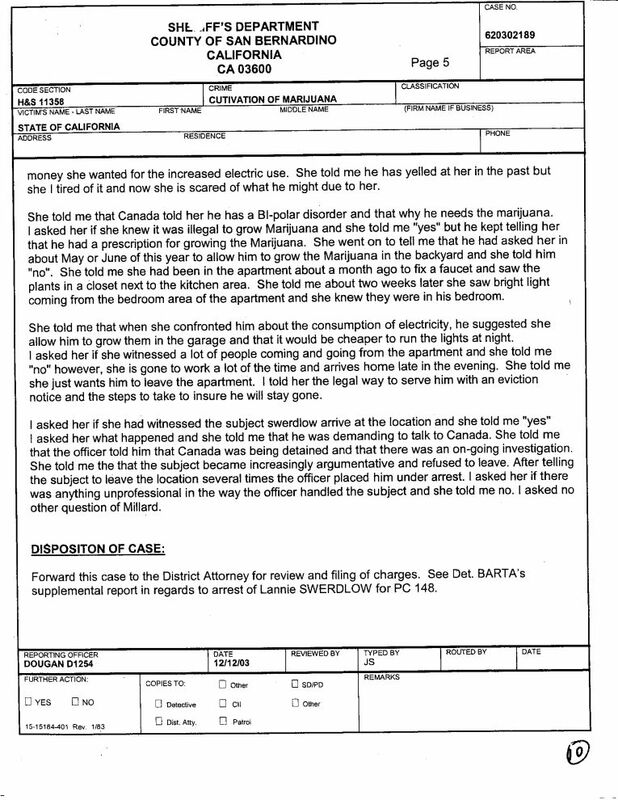 See Det BARTA's supplemental report in regards to arrest of Lannie SWERDLOW for PC 148.